We have done Southern Caribbean cruises several times, but chose this 12-day cruise because of the stops in the Dutch Antilles (the "ABCs" -- Aruba, Bonaire, Cuacao), which we have never visited before. There was also a stop in the Puerto Rican city of Ponce, which again, was new for us. We are familiar with the Summit, having sailed a back-to-back some years ago on a very memorable and enjoyable cruise. First issue happened before the ship even left -- the original itinerary called for us to visit some of the Leeward Islands (St. Thomas, St Croix, Antigua, St Kitts), then visit the ABCs. Two weeks before sailaway, this got flipped around so that we would visit the ABCs first, then the Leewards. We found out because we received an email from a private tour operator we had booked on St Kitts confirming that he had rescheduled our tour for the new date of arrival. Then we read about the change on our CC roll call board. Eventually with some prodding, our TA finally passed on the official news to us. However, several people we met on the cruise who had booked directly with Celebrity had never received word of the change, and only found out once they boarded. We arrived at the cruise port at 11:15 am, were ushered into the entry hall right away, and were on-board by 11:45 am. As we remembered from our last cruise with Celebrity, we were greeted with a glass of champagne. Our cabins were ready by 1 pm, and our suitcases arrived not too long after that. Overall, Summit looked very dated -- beige and dark brown seemed to be the predominant palette -- but the ship is scheduled for a major drydock refit less than a month after our cruise, so we&apos;re sure the decor will be modernized and in fact the elevator retrofits began overnight during our cruise. A stateroom overhaul is needed because some closet drawers and doors were difficult to close. In the bathroom, the sink had small cracks, the tap dripped, and the mirrors were tarnished. And in an age where we carry more and more rechargeable devices, there were only two AC outlets in the entire room. TV service on the small flatscreen was primitive, with only a few basic channels. However, our steward, who always seemed to be available and cheerful, ensured the stateroom was always spotless. Before we even departed we were informed there was a problem with the propulsion/navigation system. This kept us in San Juan 24 hours longer than planned, but the captain was very good about keeping us up-to-date on the problem. This affected our itinerary again, since we now had one less day of cruising than planned. We had been scheduled to stay in Aruba two days -- this was shortened to one day, but the sailaway from Aruba was extended until midnight for those that had planned evening activities on the island. Each passenger was given $100 on-board credit as compensation for the delay. This credit could be used for things like beverages, excursions, shop purchases, specialty dining, spa treatments and final gratuities, but was non-refundable -- if you didn&apos;t spend it all, you didn&apos;t get any left-over balance at the end of the cruise. From that point on, the cruise went as planned. Some comments about the ship. Dining was the big surprise. When we sailed on Summit several years ago, dining was the highlight, a cut above other cruise lines, both in terms of food and of service. This time, the appies were sometimes disappointing to occasionally okay. The mains were usually okay, sometimes very good. The desserts were a disappointment. But it was the service that was the big surprise. Or perhaps to be more accurate, the length of time for service was the big surprise. The waiter and assistant waiter were friendly, attentive and helpful. But the wait times were extraordinarily long. This is our 8th cruise, and we have never experienced anything like this before. Often once we finished a course, our plates would sit in front of us for 15-20 minutes, and then there would be another long wait for the next course to arrive. Then a long wait to order dessert, then another long wait for dessert to arrive. 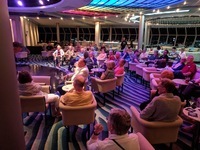 Our cruising experience has been that dinner usually takes about 90-100 minutes, a leisurely meal that still left us lots of time to get to the theatre for the evening&apos;s entertainment. Not this time -- we always either had to leave the table without dessert to get to the show on time, or wait for dessert and arrive late. For example, one night we sat down at 6:30 pm expecting to easily make the 9 p.m. show. But by 8:50 we still hadn&apos;t even ordered dessert, so we scampered up to the buffet, grabbed some dessert and got to the theatre just as the show started. (So, 2 hours 15 min to serve two courses.) Part of the problem seemed to be that we were on the Dining Select program, where we could eat at whatever time we wanted. and it almost seemed like the kitchen didn&apos;t know how to deal with our orders that were arriving at different times than the usual 6 pm and 8 pm seatings. Also, if we asked for a table for 2, we would be told there was a substantial wait, but if we agreed to sharing a table, and were the first to be seated at a table for 8, the waiter wouldn&apos;t take our order until the table was full, which might take 15 or 20 minutes for enough other Dining Select cruisers to arrive. On the other hand, many times the table was filled immediately, and our orders were taken immediately, and the service was still incredibly slow. We tried several different dining times hoping for faster service. One night the service at 5:30 was a bit faster, but the next night at 5:30 dinner took more than two hours. We were also disappointed in the table layout in the main dining room. We don&apos;t know if there were a few extra passengers on this cruise, but tables were really crammed tightly into the dining room. We were often seated at a table sized for 6 people but set for 8 people, and the backs of our chairs would be touching the chairs of the table behind us. We usually ate breakfast in the Oceanview buffet, and most of the food was okay. However, the croissants and other pastries were uniformly terrible -- chewy, sodden, just awful. Also avoid the buffet&apos;s cakes and squares at lunchtime or dinner: bland and tastless, not worth the calories. The ice cream bar was good though. (And free, unlike the gelateria, where the gelato cost money.) In the past, Celebrity&apos;s food was a definite cut above the others. On the Summit, at least in the main dining rooms, the food is good but not exceptional, however we did not pay to eat at any of the upgraded restaurants. The shows were the usual mix of revue-type shows, solo singers, tribute bands and comedians. The house troupe of young singers and dancers were good and enthusiastic but not Broadway-quality. The house "orchestra" was very tight, a real pleasure to watch. The solo singers were good but nothing special. The two tribute bands were great -- one doing a high-energy collection of Motown hits, the other all Paul McCartney hits. We didn&apos;t spend a lot of time in bars or by the pool, but the duets and small bands providing music in those venues seemed fine. The movie theatre was in a curious place -- outdoors, up on the upper (12th) deck at the stern. For afternoons at sea, this made for fairly uncomfortable viewing, since you were sitting in the sun, and it was also quite a windy place. You also got the occasional whiff of exhaust from the ship&apos;s funnel. We were much happier with the small 20-person indoor theatres found on RCI&apos;s Radiance-class ships. One other disappointment was the lack of perks for being basic Captain&apos;s Club members. There were some small discounts for services we didn&apos;t use -- 10% off an internet package, for instance -- but the only real perk was a complimentary dish of gelato from the gelateria. We did appreciate the large number of ports we visited -- 8 in 11 days. We did not use a Celebrity shore excursion -- we always find them 50%-60% more expensive than private tour operators. The one port that was a bit of a puzzle was Ponce, on the south shore of Puerto Rico. 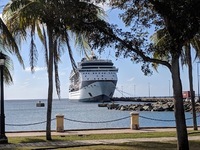 This is a brand new port for Celebrity, and it was clear that the locals were happy to see us -- there was an arts & crafts fair set up dockside, free pina coladas and rum samples, and welcoming dignitaries. But clearly both the residents of Ponce and the cruise lines are still trying to build up some activities for cruisers. The old town (a $10 cab ride from the cruise dock) has an attractive main square, but once you get past that, there isn&apos;t much to see or do. There is a nearby boardwalk with small bars and restaurants and a beach, but the infrastructuire was devastated by the 2017 hurricane, and has yet to be rebuilt. If cruise ships keep calling, hopefully there will be more things to do in the future. On our last cruise with Celebrity Summit, we felt they were ahead of the others in terms of ship and food, and we definitely wanted to sail with Celebrity again. This time, although the staff were just as courteous, friendly and professional, we feel that there was definite cost-cutting happening, and in terms of ship and food, Celebrity Summit has fallen back into the pack. We have done Southern Caribbean cruises several times, but chose this 12-day cruise because of the stops in the Dutch Antilles (the "ABCs" -- Aruba, Bonaire, Cuacao), which we have never visited before. There was also a stop in the Puerto Rican city of Ponce, which again, was new for us. We are familiar with the Summit, having sailed a back-to-back some years ago on a very memorable and enjoyable cruise. First issue happened before the ship even left -- the original itinerary called for us to visit some of the Leeward Islands (St. Thomas, St Croix, Antigua, St Kitts), then visit the ABCs. Two weeks before sailaway, this got flipped around so that we would visit the ABCs first, then the Leewards. We found out because we received an email from a private tour operator we had booked on St Kitts confirming that he had rescheduled our tour for the new date of arrival. Then we read about the change on our CC roll call board. Eventually with some prodding, our TA finally passed on the official news to us. However, several people we met on the cruise who had booked directly with Celebrity had never received word of the change, and only found out once they boarded. We arrived at the cruise port at 11:15 am, were ushered into the entry hall right away, and were on-board by 11:45 am. As we remembered from our last cruise with Celebrity, we were greeted with a glass of champagne. Our cabins were ready by 1 pm, and our suitcases arrived not too long after that. Overall, Summit looked very dated -- beige and dark brown seemed to be the predominant palette -- but the ship is scheduled for a major drydock refit less than a month after our cruise, so we&apos;re sure the decor will be modernized and in fact the elevator retrofits began overnight during our cruise. A stateroom overhaul is needed because some closet drawers and doors were difficult to close. In the bathroom, the sink had small cracks, the tap dripped, and the mirrors were tarnished. And in an age where we carry more and more rechargeable devices, there were only two AC outlets in the entire room. TV service on the small flatscreen was primitive, with only a few basic channels. However, our steward, who always seemed to be available and cheerful, ensured the stateroom was always spotless. Before we even departed we were informed there was a problem with the propulsion/navigation system. This kept us in San Juan 24 hours longer than planned, but the captain was very good about keeping us up-to-date on the problem. This affected our itinerary again, since we now had one less day of cruising than planned. We had been scheduled to stay in Aruba two days -- this was shortened to one day, but the sailaway from Aruba was extended until midnight for those that had planned evening activities on the island. Each passenger was given $100 on-board credit as compensation for the delay. This credit could be used for things like beverages, excursions, shop purchases, specialty dining, spa treatments and final gratuities, but was non-refundable -- if you didn&apos;t spend it all, you didn&apos;t get any left-over balance at the end of the cruise. From that point on, the cruise went as planned. Some comments about the ship. Dining was the big surprise. When we sailed on Summit several years ago, dining was the highlight, a cut above other cruise lines, both in terms of food and of service. This time, the appies were sometimes disappointing to occasionally okay. The mains were usually okay, sometimes very good. The desserts were a disappointment. But it was the service that was the big surprise. Or perhaps to be more accurate, the length of time for service was the big surprise. The waiter and assistant waiter were friendly, attentive and helpful. But the wait times were extraordinarily long. This is our 8th cruise, and we have never experienced anything like this before. Often once we finished a course, our plates would sit in front of us for 15-20 minutes, and then there would be another long wait for the next course to arrive. Then a long wait to order dessert, then another long wait for dessert to arrive. Our cruising experience has been that dinner usually takes about 90-100 minutes, a leisurely meal that still left us lots of time to get to the theatre for the evening&apos;s entertainment. Not this time -- we always either had to leave the table without dessert to get to the show on time, or wait for dessert and arrive late. For example, one night we sat down at 6:30 pm expecting to easily make the 9 p.m. show. But by 8:50 we still hadn&apos;t even ordered dessert, so we scampered up to the buffet, grabbed some dessert and got to the theatre just as the show started. (So, 2 hours 15 min to serve two courses.) Part of the problem seemed to be that we were on the Dining Select program, where we could eat at whatever time we wanted. and it almost seemed like the kitchen didn&apos;t know how to deal with our orders that were arriving at different times than the usual 6 pm and 8 pm seatings. Also, if we asked for a table for 2, we would be told there was a substantial wait, but if we agreed to sharing a table, and were the first to be seated at a table for 8, the waiter wouldn&apos;t take our order until the table was full, which might take 15 or 20 minutes for enough other Dining Select cruisers to arrive. On the other hand, many times the table was filled immediately, and our orders were taken immediately, and the service was still incredibly slow. We tried several different dining times hoping for faster service. One night the service at 5:30 was a bit faster, but the next night at 5:30 dinner took more than two hours. We were also disappointed in the table layout in the main dining room. We don&apos;t know if there were a few extra passengers on this cruise, but tables were really crammed tightly into the dining room. We were often seated at a table sized for 6 people but set for 8 people, and the backs of our chairs would be touching the chairs of the table behind us. In the past, Celebrity&apos;s food was a definite cut above the others. On the Summit, at least in the main dining rooms, the food is good but not exceptional, however we did not pay to eat at any of the upgraded restaurants. The shows were the usual mix of revue-type shows, solo singers, tribute bands and comedians. The house troupe of young singers and dancers were good and enthusiastic but not Broadway-quality. The house "orchestra" was very tight, a real pleasure to watch. The solo singers were good but nothing special. The two tribute bands were great -- one doing a high-energy collection of Motown hits, the other all Paul McCartney hits. We didn&apos;t spend a lot of time in bars or by the pool, but the duets and small bands providing music in those venues seemed fine. The movie theatre was in a curious place -- outdoors, up on the upper (12th) deck at the stern. For afternoons at sea, this made for fairly uncomfortable viewing, since you were sitting in the sun, and it was also quite a windy place. You also got the occasional whiff of exhaust from the ship&apos;s funnel. We were much happier with the small 20-person indoor theatres found on RCI&apos;s Radiance-class ships. One other disappointment was the lack of perks for being basic Captain&apos;s Club members. There were some small discounts for services we didn&apos;t use -- 10% off an internet package, for instance -- but the only real perk was a complimentary dish of gelato from the gelateria. We did appreciate the large number of ports we visited -- 8 in 11 days. We did not use a Celebrity shore excursion -- we always find them 50%-60% more expensive than private tour operators. The one port that was a bit of a puzzle was Ponce, on the south shore of Puerto Rico. This is a brand new port for Celebrity, and it was clear that the locals were happy to see us -- there was an arts & crafts fair set up dockside, free pina coladas and rum samples, and welcoming dignitaries. But clearly both the residents of Ponce and the cruise lines are still trying to build up some activities for cruisers. The old town (a $10 cab ride from the cruise dock) has an attractive main square, but once you get past that, there isn&apos;t much to see or do. There is a nearby boardwalk with small bars and restaurants and a beach, but the infrastructuire was devastated by the 2017 hurricane, and has yet to be rebuilt. If cruise ships keep calling, hopefully there will be more things to do in the future. On our last cruise with Celebrity Summit, we felt they were ahead of the others in terms of ship and food, and we definitely wanted to sail with Celebrity again. This time, although the staff were just as courteous, friendly and professional, we feel that there was definite cost-cutting happening, and in terms of ship and food, Celebrity Summit has fallen back into the pack. 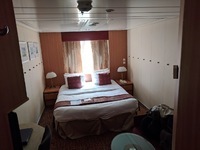 It was clear that a major stateroom overhaul was needed. (The ship will be refitted in drydock in February/March 2019). Some closet drawers and doors were difficult to close. In the bathroom, the sink had small cracks, the tap dripped, and the mirrors were tarnished. And in an age where we carry more and more rechargeable devices, there were only two AC outlets in the entire room. TV service on the small flatscreen was primitive, with only a few basic channels. However, our steward, who always seemed to be available, ensured the stateroom was always spotless. Shared a taxi to Fryers&apos;s Bay, where we rented chairs and umbrella and spent the day on the beach. There&apos;s a restaurant/bar at the end of the beach with washrooms, and other washrooms behind the beach. Fabulous soft sand, calm waters, very little surf. We booked this at the cruiseport. It was supposed to be a 2-hour tour, our driver threw in some extras so it was actually 3 hours. He then dropped us off at Eagle Beach and picked us up at exactly the time we requested. Eagle Beach was super fine sand. We rented two chairs and an umbrella for $20. There was a nearby food truck, and a bar. There were washrooms and changerooms across the street ($1 per visit). A very relaxing, enjoyable day. We had a super day -- driving along at 15 mph, very windy place, salt flats, flamingos, rolling waves. Sorobon Beach was a nice stop for lunch. Those that like getting places might find the pace too slow, but we had a great time. Golf cart was in great shape, easy to drive, no problems with it. Map and directions provided. Close to the cruise port, great value for the money. We downloaded an architectural walking tour of Willemstad, and that took us all day (and 20,000 steps), often outside of usual tourist areas. Very interesting, and we got a good sense of Willemsted&apos;s history. We took a taxi to Christiansted ($16 pp return), shopped (shops were not very busy), and ate lunch at a brewpub right on the harbour. Tour of Nevis included ferry to Nevis, 3-hour tour of various sites, then 2 hours at Ouabie Beach (restaurant/bar, free beach chairs, washrooms), a water taxi back to St. Kitts and ride back to cruise port. Great day, very beautiful and historic. Taxi to Magen&apos;s Bay, rented chairs and umbrella, spent the day watching pelicans dive into the water. Very calm and warm, nice sandy bottom. Admission was $5, chairs + umbrella was $26. Beach/restaurant on beach, no charge for washrooms/changerooms. Only two ships in port, so beach was not very crowded.